Mediterranean cuisine covers many different countries in the Mediterranean basin. Every region has different influencing flavors in its food, however, there are core flavors that can be tasted throughout the Mediterranean region as a whole. Southern Europe features deep flavors such as the tomato-based flavors of southern Italy or the tangy and savory flavors of Greece with the use of bold cheeses and softening yogurt. In a country such as Morocco, the food is heavily seasoned in perfect blends for full rich flavor. Balsamic vinegar comes from Italy, traditionally made from aged grape must. It has a rich flavor, much more complex than the typical wine vinegar, with hints of sweetness. 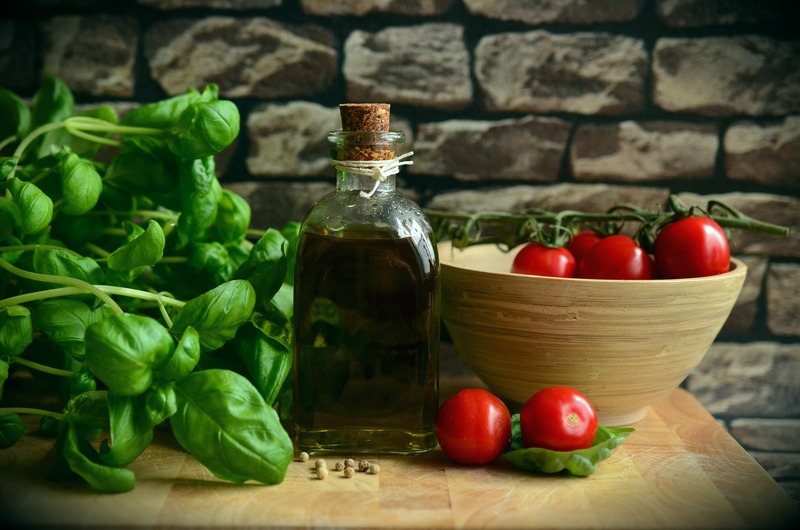 Balsamic vinegar is not meant to be cooked and is often used as a topper for fresh fruit and grilled meat or fish. 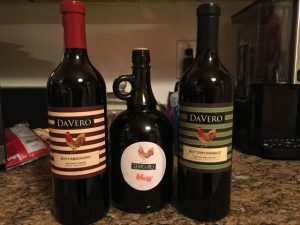 Many different types of Balsamic vinegar now exist locally and internationally which is a point of debate in many circles as to what is “real” Balsamic Vinegar. Bon Appetite Magazine does a good job of helping you sort through the various kinds in a 2017 article here. Lemon is a flavor that can be found throughout Mediterranean cooking and is often found alongside garlic, cumin, coriander, oregano, and parsley. Lemon is a much-appreciated ingredient because of the compatibility of its citrus tones with common Mediterranean dishes like fish.When you can get freshly picked lemons use them! 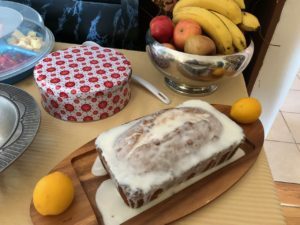 Two of my recent favorite recipes include ways to preserve them and a “rocken” lemon cake recipe from King Arthur Flour that I think is hands down one of the best Lemon Bundt cakes I have ever had. Best part it translates into two loaf pans nicely as well. Oregano is best known for its uses in Italian cooking, but what not many people know is that there is a difference between Mediterranean oregano and Mexican oregano. Mediterranean oregano features a softer, sweeter, and more minty flavor than its Mexican counterpart, and is used in a variety of Mediterranean spice mixes, from Italian seasoning to Zataar seasoning. Tomatoes are powerful in almost every Mediterranean region’s cooking. It is a flavorful crop that can be kept and presented in many way, tomato paste, tomato purée, etc. It holds a very sultry flavor that can be sweetened or more rustic. A flavor that goes well with pasta, rice, meat, seafood, vegetables and so forth — making it very versatile. Melt the butter and add the turmeric and cumin. Stir just until fragrant, about a minute. Add the rice, make sure it is well coated and toast in the seasoning for about 4 minutes. Add chicken broth, bring to a boil and then let it simmer for 15 minutes. Mix all the spices along with generous amounts of salt and pepper and 1 tbsp olive oil. Doing this in a bag will make working in the yogurt easier. After it is mixed thoroughly, add the chicken and onions and let sit overnight. Heat the remaining 1.5 tbsp of olive oil, add the chicken until cooked and serve with the yellow rice and tzatziki sauce. Posted in Fun Finds, On Eating Around. Tagged Food Finds. We did a “jump in the car” roadtrip to get out of the city today. First stop was the always friendly Hole In The Wall. It continues to be one of our favorite “go to” spots. Friendly staff & good solid food makes for a destination worthy meal or while spending time in the Northern California region. Known for a great breakfast; biscuits, gravey and hash rock thoseorning branches, but the hamburger & sandwiches make for a full belly. On this trip I tried out the ground duck burger on server recommendation, and will say- it was right on the money. We did an jump in the car roadtrip to get out of the city today. First stop was the always friendly Hole In The Wall. It continues to be one of our favorite “go to” spot. Our new pals Adrian & Julie stopped to swap food dish in between serving up our meals. 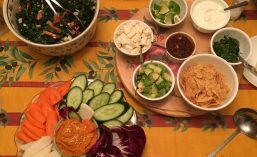 Posted in Fun Finds, On Eating Around, On Travel. Tagged Food Finds, resturants. 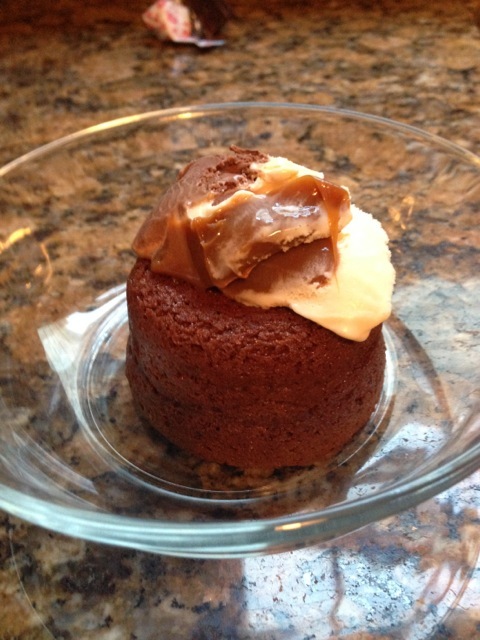 Any one can knock out a lava cake these days. less than 15 min. The recipes is easy and as is comes out good. I altered the recipe a bit and added vanilla and a splash of espresso to make the chocolate taste more chocolaty.. 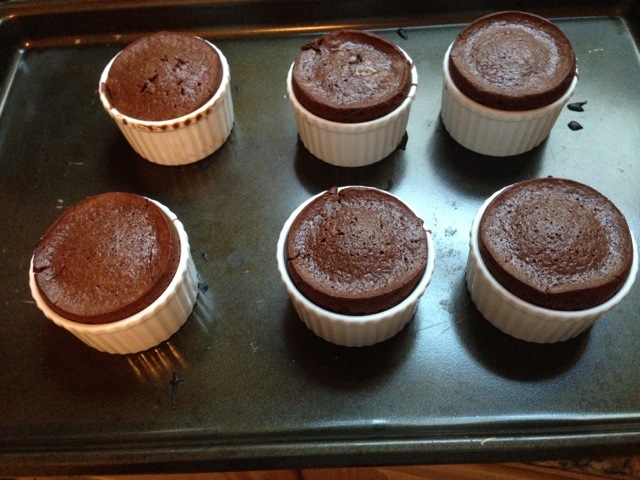 The package comes sized for 6 small ramekins – so you may need to purchase them as well. Bake time says 12 – 15 min. 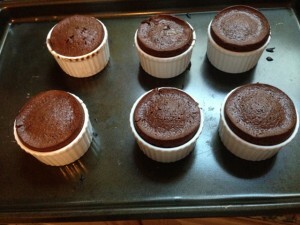 I suggest you check them at 10 min, then take them out by 12 min to really get the gooey center. 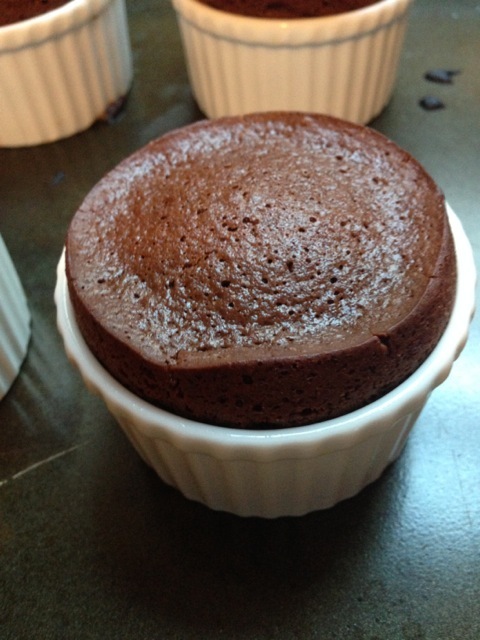 Otherwise you will end up with a pretty nice brownie cake. The cost of the premix box is around $9 makes 6. Posted in Fun Finds, Recipe? What Recipe?. Tagged Food Finds, Fun Finds, resturants. 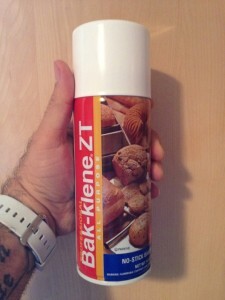 This Christmas one of my work colleagues gifted me with Bak-klene ZT cooking spray. 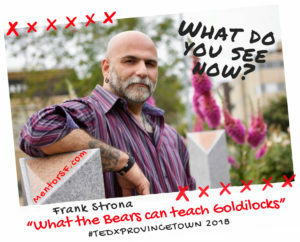 Yes – I know – you might wonder why?? Well – we often all talk about food and She had heard about this particular brand and thought of me ( Note – this is what gifting is all about – thinking before hand and knowing the person – not because its been marketed since october and with the biggest most budget). So, I digress.. I had always tended to use what ever spray I had around the house – but never found them great. Till now – Bak-klene converted me! Not only does it go on easy and provided me with the non-stick coverage I wanted – it has no after taste or leave a funky texture on the cookware. It also has zero-transfat and is used in many profession kitchens I have heard tell. I have been working with it now since December and even the stickiest messes I have managed to bake up – have simply slid out! Available at Williams-Sonoma or Amazon – at almost $10 its not cheap – but its well worth it. Posted in Fun Finds. Tagged Food Finds, Fun Finds. 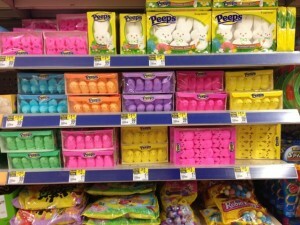 Ahh… Valentines day is a memory and Easter and the Peeps hit the shelves at Walgreens! 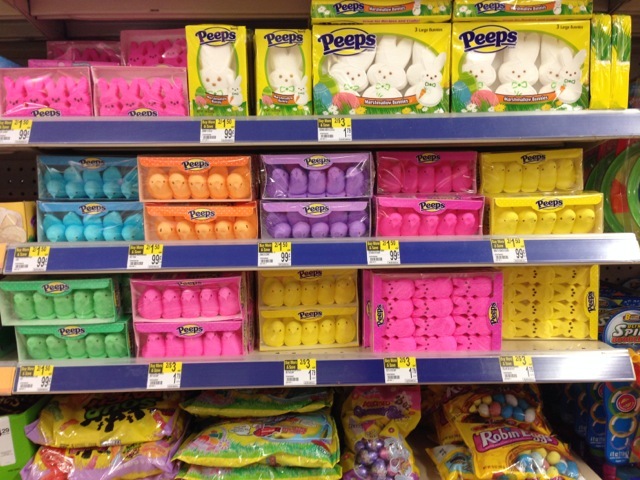 Spring must not be far behind – as the sticky, squishy, slightly crunchy Peeps have invaded the stores. Recently at Walgreens here in the Castro – I ran right in to not 1 but three shelves. I think along with cockroaches and some conservative politicians, Peeps my outlast us all. According too Wikipedia and a a short visit the website for Just Born – Peeps are produced by Just Born, a candy manufacturer founded in Bethlehem, Pennsylvania, by Russian immigrant Sam Born. In 1953, Just Born acquired the Rodda Candy Company and its marshmallow chick line, and replaced the painstaking process of hand-forming the chicks with mass production. When founder Sam Born would display a sign for his freshly-made candy, he would title it “Just Born,” playing off of his last name and the fact that he made his candy fresh daily. Posted in Fun Finds, Rants & Raves. Tagged Food Finds. On Saturday I got the urge that Vietnamese was in order. I put the call out on Facebook to see who my peeps thought were venues worth checking out. Of course, without thinking – we arrived around 6:45 with-out reservations – – the place was hopping but the very efficient host, once we asked, put us on the list and we were seated about 30 min later. Hint – there seemed to be an early crowd then a around 8:30/8:45 lull in the crowd, with another hit coming soon after. The place has a great casual faced-paced vibe – this is not the place you go to be chatty with the wait staff unless you happen to be fluent in Vietnamese and even then – the side talk we brief. 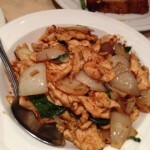 But once seated they pretty much leave you be while you eat – so we weren’t feeling rushed which I liked. We were hungry, so sat and ordered the fried calamari and the fried spring rolls right off. While debating our main meal options – we devided and went with Lemongrass chicken (which has a little spice/heat to it), the 5-spice chicken (which is more deeper flavor but not hot spicy) and the Roasted Crab. 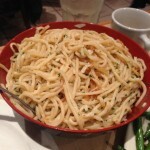 We also ordered the garlic noodles (of course) and the string beans – which were rocken. We had ordered the crab fried rice – but the kitchen never sent it out – so thats on the next try. Oh and we gilded the dining lily and also order the fried Banana’s with the ice cream to share. The food comes out pretty fast – and is very hot. The Calamari was some of the best I have had. 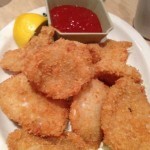 They use the Calamari steaks with the breading – quick fried – they were tender and melted at the bite. 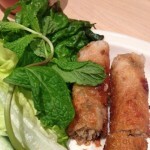 The Springs rolls were dense and chewy – when dipped in the sauce with the basil and lettuce was a great start. As the main courses came out, we dug in. They weren’t sent out in any order or all out at once – so it was good that we had lots of options. Both chicken dishes were good. Rich in flavor and a nice sized portion. The Crab – which came out last, was we heard while waiting in line – one of the crowd favorites. 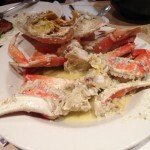 Hot, messy, packed with a garlic butter sauce, and just enough of the innards left in that you got the flavors of crab. It comes partially prepped – but you will still need to be prepared to get “as one” with your food to get to the meat. (FYI -the drunken crab is the version with the white wine). Oh – there is a reason they call the place PPQ – Dungeness Island – they offer the crab 6 ways. The garlic noodles were good as well – but make sure you specify how many to order -if you are getting lots of dishes start with one order to share – you will find a little goes a long way unless its your primary meal. Over all a good time – the place does well with couples, to groups and is deceptively large with a back room and second floor. While we were standing there at least 5 calls came in for reservations on valentines day.. hint hint. 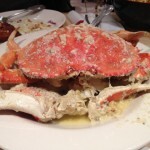 The prices are moderate – entrees running $10 – $14, the Crab around $38. But we also had enough food to bring home for lunch – our average price of the meal was about $50 each. Posted in Fun Finds, On Eating Around. Tagged Food Finds, Fun Finds, MIssion, resturants, Vietnamese. OK – So for years now this part of the Russian River has been struggling to find its own groove and identity. Well with the fast raising trend in Restaurants and venues like what the folks from the Boon family of enterprises is putting out – its found the groove. Not only have they found a way to be true to themselves but that were able to mix it with quality food, good prices, a great wine list and most of all – they get the service industry. Not once do you ever feel like they are doing you a favor by being open. Boon Eat & Drink never fails. They make the standard fare of burgers and steaks come alive with a reason to order then again – but its the seasonal and weekly specials that make this really stellar – from the produce they grow themselves to the cuts of meat to the combinations they package it all in – it all works. 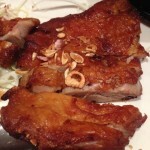 No way my photos could do the food justice – so these come right from Boon! Posted in On Eating Around, Rants & Raves. 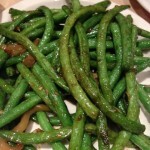 Tagged Food Finds, Fun Finds, Guerneville, resturants. When I travel – I tend to eat regionally. My Sister turned me on to these folks a few years back when I was out in Provincetown for a summer trip. The Fairway Resturant and The Hole In One in Eastham has an incredible group of granola mixes that I think is some of the best I have had. It essentially is nutritional “crack”. I like it so much I tend to order it and have it shipped all year round. Located on Route 6 in North Eastham, this 20 year old, family run shop, specializes in fresh, hand-cut donuts and warm, friendly service and a way about granola that is dangerous..
Posted in Fun Finds. Tagged Food Finds, Fun Finds, Provincetown. When I cook for friends and need a stuffing, it always made me a bit stressed as to how to work with some of the prepackaged GF stuffing cubes. Then one Thanksgiving I came across the handmade granola from Nana Joes here in San Francisco. Mixed with spinach, nutmeg, chestnuts, eggs- this made a great stuffing – so good no one felt shorted. I came across them at our local farmers market here in the Castro and immediately connected with the Orange, Cardamom, Walnut as a possible solution. This local find is available at stores and at many of the farmers markets. Posted in On Eating Around. Tagged Food Finds.